Send you portion of our 70/35 Russian (Soviet) technology. While we solve the problem of communication, I want to send these 3 images to you of the most POWERFUL cinema machine in the world, the KP-50. Engineered in the USSR. It had an effect of 50.000 Lumen in 70mm mode. On photo 2 and 3 I show you the last surviving copies if the KP-50. It was installed in the Kremlin palace. They were moved to a storage facility during summer 2008. 1. KP-30 30.000 lumen with carbon arc lamphouse (200 ampere). A true workhorse, just like DP-70. 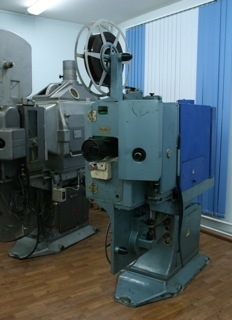 This machine was commonly installed in Moscow's, St. Petersburg's and other big cities of the former USSR in purpose- built 70 mm cinemas. The machine is 10 on the 1-10 scale. 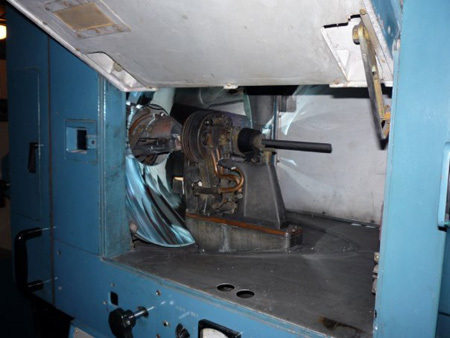 This machine was replaced by KPK30 model which used Xenon lamps and a different lamphouse. While using 10Kw water-cooled Xenon lamp, the machine delivered 30.000 lumen just as its predecessor. 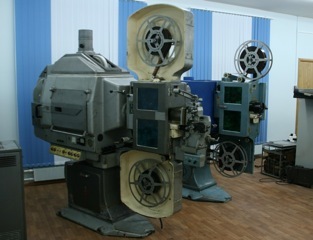 These machines are still in use in many theaters across former USSR. For example they are still working in a 6 theater multiplex in the city of Ufa, albeit only in 35 mm mode. 2. KP-15 (originally with carbon arc lamphouse) and KPK-15 delivered 16.000 lumen. KPK-15 used water-cooled 5Kv Xenon lamp. KP-15 machines were slightly smaller in length thank KP30 models due to a smaller lamphouse. ALL KP line worked with both 35 and 70mm film and was manufactured by KINAP factory in Odessa (Ukraine). Production cycle 1958-1983. There was a prototype of another 70/35 machine based on 35mm line KSA series known as XENON. The machine was called Xenon 5U, but it never went into mass production. I think I might find a picture of it somewhere. There were only 6 pieces manufactured of KP-50 with carbon arc lamphouse (300 amp) for the Kremlin Palace of Congresses. The machine was designed for extra big screens and theaters. As with Xenon 5U KP-50 never went into mass production although it went beyond the prototype stage. The Russian 5 and 10 Kw water-cooled Xenon lamps are not produced anymore, so existing installations use OSRAM and OSHIO lamps up to 7 Kv in both vertical and horizontal configurations. In the former USSR there were more than 800 purposely built 70 mm movie theaters. 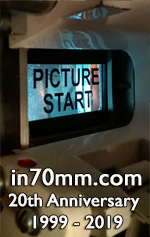 More 70 mm installations were used in big Cultural Houses across the country. At present this whole cinema system is in ruins and all that is remains is a miserable reminder. Considering that typical installation contained 3 to 4 machines, one can estimate that there were more than 3500 units produced. Film 35 and 70 mm. Lens holder for one projection lens. Remote framing and focusing is possible. Film speed: 24 fps only. Light power: depending on the model 15.000, 30.000 or 50.000 lumen with 70 mm aperture and no film in the film gate . Possible change-over, curtain operation and house lights operation automation with external AKP-6 device. There is KP30-V with super-intensity water-cooled fully automated arc lamp working at 200 amp, and creating 30.000 lumens while projecting 70 mm film. The machine is capable of reproducing 4 and 6 channels mag sound of 35 and 70 mm prints as well as optical mono sound of 35 mm prints. 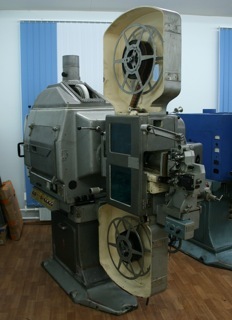 The machine shown here has 16mm projection adaptor attached to it. The finish is silver, pretty similar to the one used in DP-70. 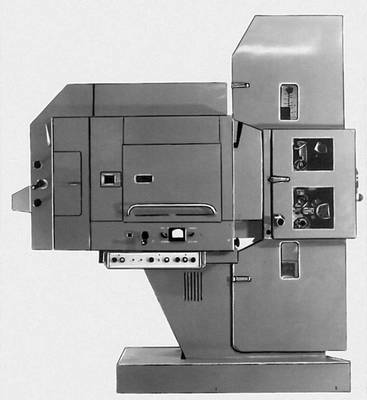 The KP30 machine is the one modelled on the DP-70 which Michael Todd brought to Moscow together with TODD-AO camera when he proposed a co-production of "War and Peace" to the soviet ministry of culture in 1957. The proposal was rejected, however, but the equipment stayed in the USSR, and was used in development of Sovscope 70 line of products. The KP line consisted of KP30A/B/V(c), KP-15 and KP50. Later KPK30 with xenon lamps superseded the KP30 and KP15 models. More than 3000 units were manufactured for the entire line, but KP50. The KP50 were almost hand made and no more than 20 units were manufactured. 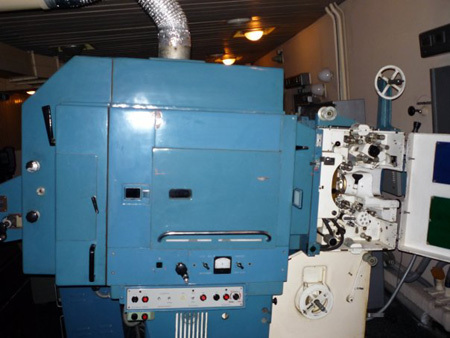 Five KP50 machines were installed in the projection room of the Kremlin Palace of Congresses. They have been removed about a year ago and stored elsewhere. 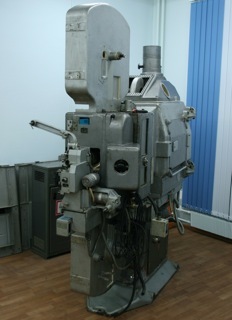 All machines used the same projection head, and differed only in lamp houses which worked at nominal 150, 180, and 200 amp, and delivered 16.000, 30.000, and 50.000 lumen respectively for 70 mm projection. KPK30 projectors could use 5 to 15 Kw Xenon lamps with air and water cooling, delivering comparable amount of light. All those machines where manufactured by KINAP factory in Odessa (Ukraine).